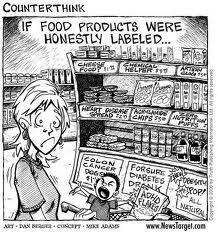 If Food Was Honestly Labelled! ~ by 1fatgirlshrinking - Diane Kirby on May 1, 2012. Haha. This is great! My wife recently started to really pay attention to what we eat. The number of food documentaries I have seen in the past few weeks would startle you! Thanks for posting! It kind of makes youwant to grow your own, doesn’t it?